As I mentioned at the end of my last post, I have been working on a new roombox based on a 17th/18th century drying attic. A drying attic is a room at the top of a house where laundry was dried and ironed and some items were stored. This room was the domain of the (laundry) maid, so this room is quite plain, with white plastered walls and only the most necessary furniture. The main piece is the large cabinet in the center of the back wall. It was a bit tricky to make because of the odd angles. The two benches on either side of the cabinet are for holding laundry baskets and ironed laundry before it is put away. The whitewashed table is an ironing table, copied from the one in the Petronella Oortman dolls house in the Rijksmuseum. The ironing table consists of a board and trestle legs. The trestle legs also had some odd angles on them, but to fit them together perfectly was a fun little puzzle. In the 17th century (earlier and later too) attic floors were made from spruce wood. The attic floorboards were usually flat sawn, showing that wonderful cathedral grain which in Dutch is referred to as 'vlammen' (flames). Unfortunately I was unable to find anything like that in scale, but I have kept last year's Christmas tree (along with several large conifers I cut down in my garden) to see if I can get 'small flamed' wood from it when it has dried. That's all for a next project. After a long search and some support on the Fine Miniatures Forum I eventually found a small piece of fir which had wonderful small knots and a fine grain. I cut the wood on the vertical grain and although it doesn't show the flames (they would be terribly out of scale) it does show all the little knots. With a watered down light stain I think the floor looks perfect! 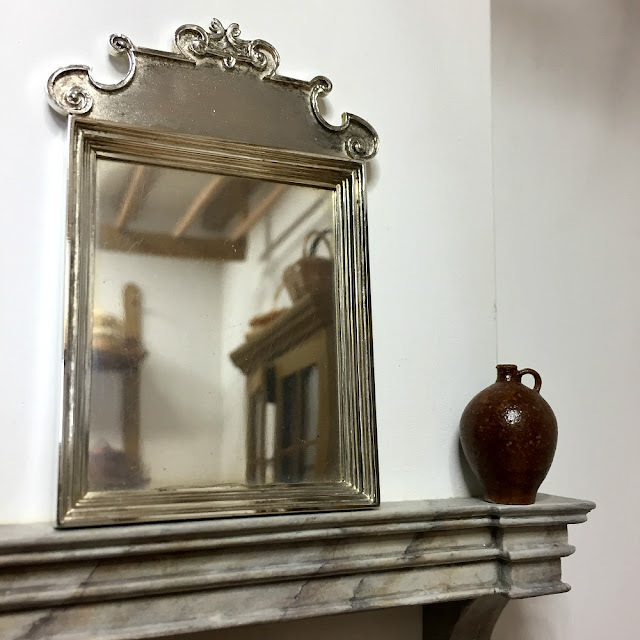 On the left wall of the room is a simple small fireplace. Not a common feature of drying attics (oh! imagine the soot on the laundry! ), but it gives the room a bit more opportunity to play and collect. 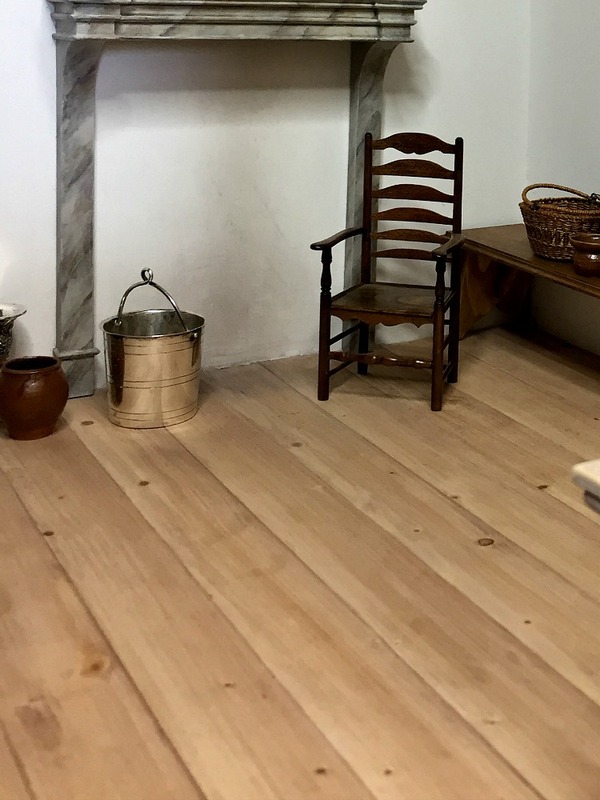 As seen in many 17th century dolls houses, the floorboards run to the back of the fireplace so a hearth plate, fire back and fire basket are needed before a fire can safely be made. In the reflection of the mirror a shelving unit can be seen on the opposite wall. To accommodate an ever-changing collection of miniatures, I came up with the idea of adjustable shelves. 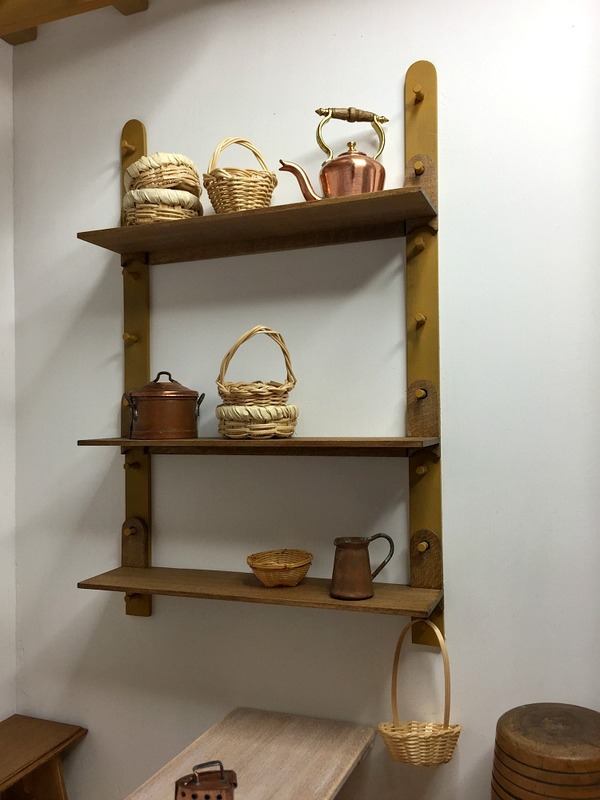 With a wink to Shaker peg rails, I turned the peg rails vertically and hung shelves from them, making the shelves easily adjustable in hight. A fun little demonstration below. Of course no drying attic would be complete without a drying rack. 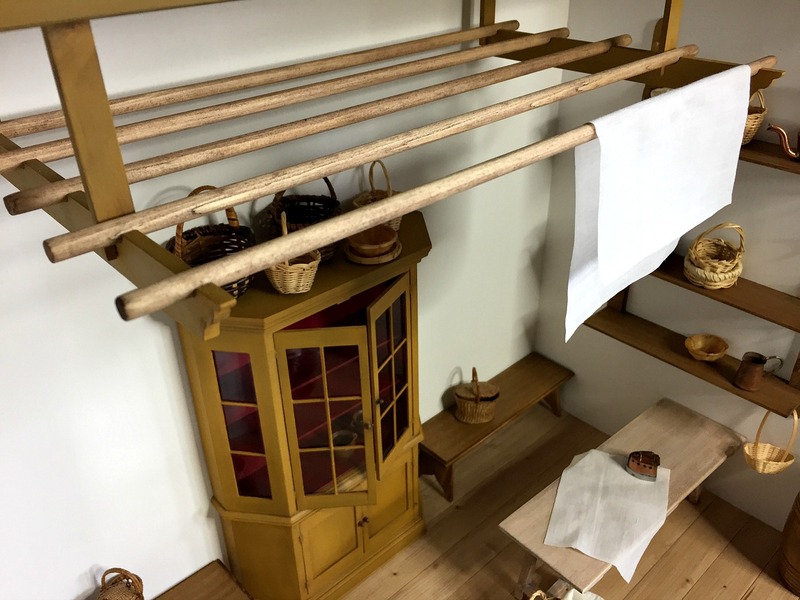 The drying rack hangs from the ceiling beams and has five long wooden poles on which the laundry would be hung to dry. Oh, it's so beautiful. I feel like the simple things in miniature are the hardest because of the exactness you need and everything here is perfect. The tiny knots in the wood are such a lovely detail! Gorgeous. Thank you! It was a long search for the right wood and it was a bit of a lucky find, but worth it. I think it is my favourite part of the roombox. Thank you Elga! Ready for Chicago? You must have worked so hard for it. So simple and elegant. I love your floors. And that drying rack is wonderful! What a beautiful job you have done creating this room. Haha Catherine! Yes, the ladder is hanging against the fourth wall. ;-) To be honest I wondered about the same thing. There is no mention anywhere (that I have read anyway) of how the laundry was put up there. Maybe a stepladder, maybe they took the poles down with some gadget on a stick. I don't know. There is no pulley system and the Dutch are tall, but not that tall. Everyone always forgets the fourth wall. Out of sight out of mind. :-) WOW! What a great invention those shelves are! They really look like a miniature version of an antique. My mother was telling me they had a drying rack similar to the one I made when she grew up, but it had a pulley system. The ones I have seen in the big houses are all fixed to the ceiling beams without a pulley or other system to lower them. ¡Impresionante!. Me encantan las explicaciones y el mimo que has puesto en el trabajo. ¡Muchas gracias por los elogios Isabel! You're welcome and thank you! ;-) 1/48 scale, I have a lot of respect for people working in such a small scale! It is a wonderful house with lots of great rooms to work on. Have fun with it! Wow! I remember seeing the house, and the 'drying room' in the Rijksmuseum, when I visited your fair city years ago. My daughter and I spent about three hours in that section alone, and came back to the 'Rijks' as we came to call it at least three more times to see the fabulous artwork too. That trick for adjustable shelves is genius; now I think I want it in my RL workroom! Thanks for sharing, be safe. I can imagine you spending three hours in that dolls house room, there is so much to see! Yes the Rijks (we call it that too) is a wonderful museum. Not too big but plenty to see for several visits. Those type of shelves come in modern metal versions too (without the pegs) but I like the rhythm of the pegs, they are so visually pleasing. I can imagine them in a lovely cherry wood or so, like the Shakers did theirs. Hi Josje! This room looks so elegant, functional, serene... timeless.... I guess the needs of a laundry didn't change much until the 20th century! I thought you were building a drying room in your Canal House attic? The cupboard you have made is amazing.... those angles seem so unusual! The ironing table on its trestles is a bit like a medieval dinner table or "board" that was set up for the meal and stored when not in use. As usual, your setting is so visually satisfying... and so hard to believe it is miniature!!! Ah yes! Trestles! That was the word I was looking for when I wrote the post. I couldn't remember what they were called and kept finding only the saw horse legs. I will change it in my post. Thank you! I don't know whether the ironing table was actually stored away as they wouldn't have had the need to do that like they did with the dining tables. It is funny that in Dutch we now say 'strijkplank' (ironing board) whereas the 17th century version was referred to as 'strijktafel' (ironing table). Hi Josje!Isn't language interesting? "Board" still refers to the "meal" that "boarders" get when renting a room! We use "ironing board" over here too. I am always using paper and cardboard "mock-ups" when cutting pieces that have angles to them! It is hard to be precise with tiny pieces anyway! Your cabinet looks just Perfect!!! Oh yes, I do mock ups too, and draw everything out on paper and on the wood too so if I turn the wood over I can still look at the pencil line to know which way to cut it. Language is interesting. In school I was always surprised how much (old) English en Dutch are alike. In this context the word 'strijken' means to iron, but it also means to stroke. Strijken-stroke... see? 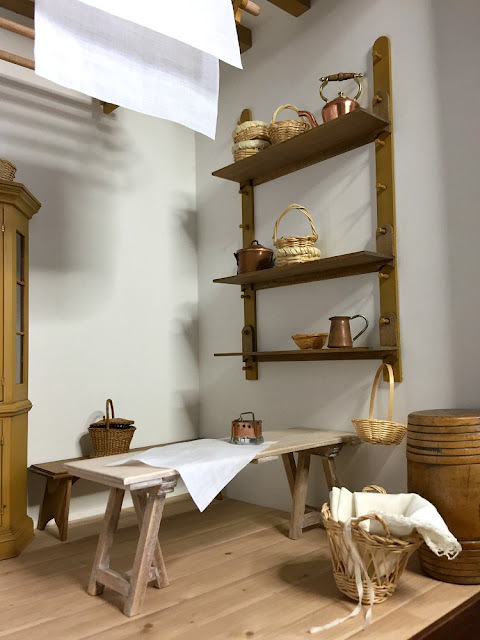 I had long wooden rods installed into my Real Life laundry room and they work a treat for drying although I still don't enjoy the Real Life ironing very much. 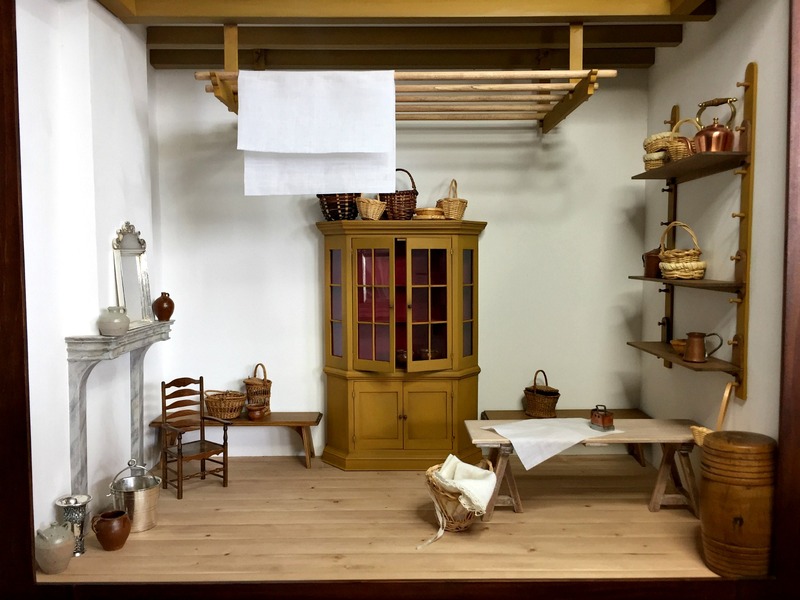 I love the notion of having a drying attic in miniature ESPECIALLY when it looks as Interesting and as Lovely as yours. 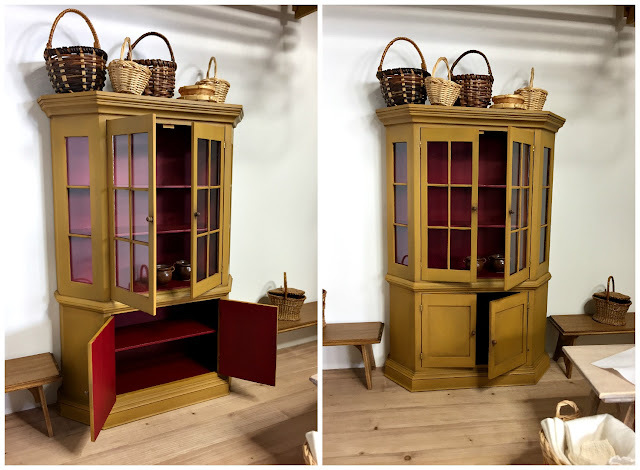 The cupboard with the oxblood- painted interior and the various accessories you included, give your entire composition an atmosphere of a Dutch Still Life. Dear Josje, this room is just so lovely. I love how the room is beautifully simple but the more you look the more fine, fine details you find. The floor is amazing! I grew up in Scandinavia and that is exactly how the pine floors look - oh so inspiring. Thank you Anna! I love the simplicity as well, the plain plastered walls, untreated floorboards and not too many colours. I am so happy with the floor. I think the hunt is on for some more wood with tiny knots, as it has always been what I intended in the dining room of my second canal house. What I have there now was an attempt to copy pine flooring but I failed at achieving it. I have never been happy with that floor. prachtige kast in een hele mooie kamer! hoe zouden de dienstboden de strijkijzers verwarmd hebben, kooltjes meenemen uit de keuken? What a great room! I enjoyed reading all the details. 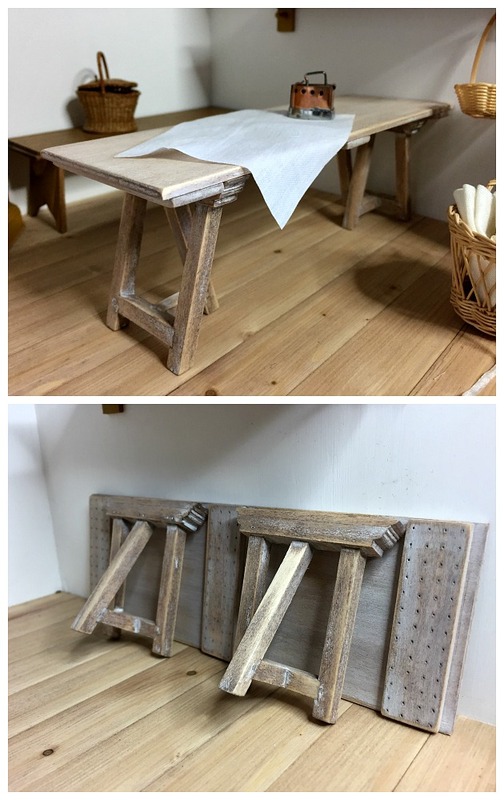 This is lovely and I'm very impressed with your folding table. I can only imagine how long that took to work out! So if everything has to slot together at and angle, it takes me a bit of time to work it out. I was rather proud of myself when it all fit together nicely, haha! Hi Josje, What a wonderful room. I must mention that the short video of the changeable shelves is quite hypnotic! Also, what a great idea! I think that the trestle ironing table is my favourite as I can imagine the poor maids up in the attic ironing for hours on end. The smell of steam and the damp sheets dripping from the hanging rods. I did see the Oortman doll houses in the Rijksmuseum and I was surprised at how large they are. The flooring was quite a challenge I can tell but the knots in the wood are perfect. Great work Josje and so glad that you shared it and we can explore it through your blog. Thank you Janine. 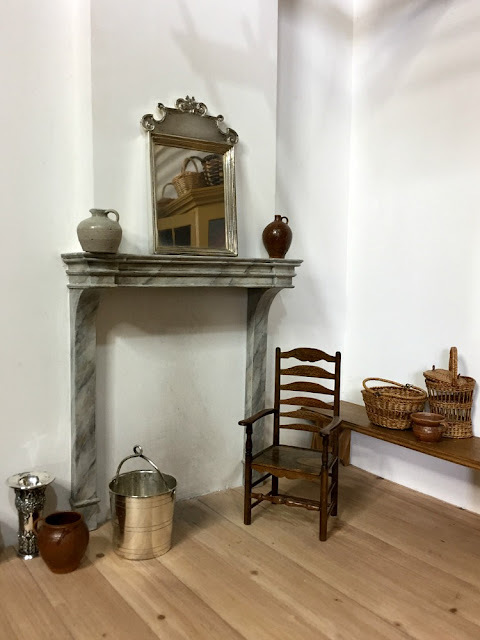 Yes, the fact that these rooms are represented in the 17th century dolls houses and the size of these rooms is an indication of their importance in the households. Expensive linen was a status symbol and part of a woman's dowry, so it needed to be taken care of properly. It was very interesting to read and see the wonderful pieces you created for this room. It made me realize how fortunate we are to have washing and drying machines. Thank you so much for the wonderful photos of this beautiful room. It is magnificent in it's simplicity. I can imagine it wasn't simple, though, to make the cabinet and ironing table. They are both perfect, and your vertical "Shaker" shelf pegs are ingenious. Love it all! Superbe travail! J'adore ces tons clairs, tout est si net, si pure. 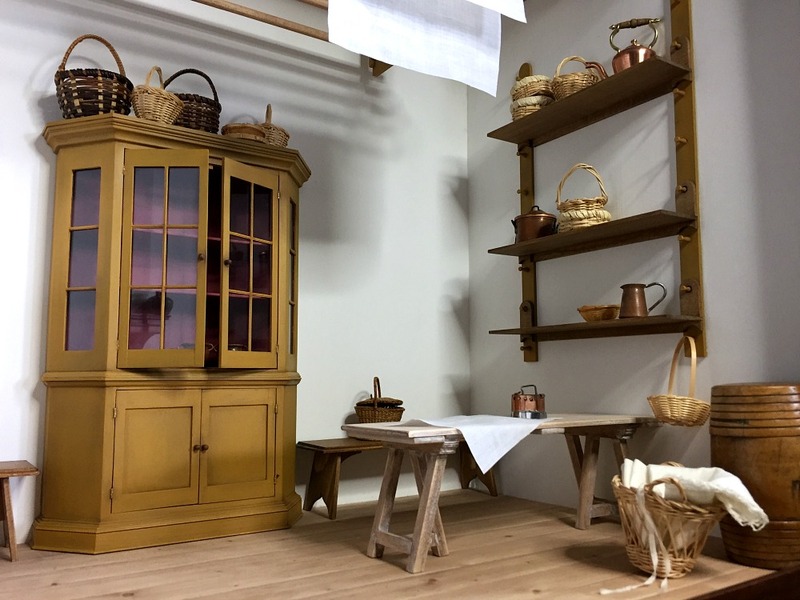 Le plancher avec les nœuds dans le bois à l'échelle est parfait, l'armoire, la table de repassage et l'étagères sont très originales. Comme toujours avec vous Josje, du grand art! Hallo Josje, De kleerzolder/Linnenkamer is heel mooi geworden. Elegant in zijn eenvoud. Het wandrek is een goeie vondst en hoewel ik geen referentie weet, oogt hij heel natuurlijk en echt. De schouw is mooi gemarmerd. In de kleerzolder van Huis ter Swinnendael heb ik er ook eentje gepland. Ik zet er dan een kacheltje van Arjan in zodat om de as en roet bij de was weg te houden en de strijkijzers op te warmen. Volgens mij niet iets dat voor de 19e eeuw gebruikelijk was maar wel mooi. Jouw droogrek is ook mooi afgewerkt. Je bent echt heel goed met houtbewerking in miniatuur. Ik ben benieuwd wat jouw volgende project wordt. Dank je wel Huibrecht! Ja ik dacht nog aan zo'n kacheltje, maar inderdaad denk ik ook dat dat er in die tijd nog niet was. Een van de inspiratiebronnen was de linnenkamer van kasteel Duivenvoorde, niet al te ver bij jou vandaan! Duivenvoorde is inderdaad niet ver hier vandaan. Ik ben er al lange tijd niet meer geweest. Misschien is het goed om hier weer eens naar toe te gaan en wat referentiefoto's te maken. Het is een schitterende buitenplaats. This is such a terrific use of attic space and is such a fun room to have in a miniature house. the cabinet is stunning and very handsome. I also love the shelving and the ironing table. Everything, down to the floorboards, looks absolutely perfect and your accessories are wonderful. Well done. Thank you Giac! And thank you for your birthday wish! Your drying attic is breathtakingly beautiful! I love the floor, the adjustable shelf, and that ironing table, it's the best! Wonderful, serene, calm, peaceful !Q As much as I hate ironing I could do with a better spirit in a room like this. Thank you Rosanna! I suppose a calm and peaceful room would make the task of ironing better, but only a little... It's just never going to be fun, is it? In één woord: prachtig, Josje, alsof je zó het verleden instapt. Je hebt deze zolderkamer geweldig mooi uitgewerkt tot in de kleinste details! Ja, vurenhout zoeken dat vanwege de noesten/vlammen ook in mini gebruikt kan worden, daar ben ik jaren geleden ook al eens mee bezig geweest, maar ik heb het toen, net als jij, ook niet kunnen vinden. Dank je wel Ilona. Ja het is een lastige houtsoort om in miniatuur te verwerken. Ook ik heb het jaren geleden al eens willen gebruiken, voor de chinoiserie eetkamer, maar kon het niet vinden. Ik heb toen ander hout gebruikt en de noesten en vlammen erop getekend en geverfd, maar dat werkte helemaal niet. Die vloer zit er nog steeds in, maar ik ben er nooit blij mee geweest. Die gaat er nog wel uit! ;-) Nu op zoek naar nog zo'n mooi stukje hout want voor de linnenkamer had ik net genoeg. Dank je wel Gonda. Ik ben er ook blij mee.